I am super excited today about a brand new filter called AI Sky Enhancer. What’s it do? That’s simple, it makes skies look AMAZING. How Do You Get AI Sky Enhancer? The new AI Sky Enhancer filter is part of Luminar 2018. It’s included in the 1.4 free update released on November 1, 2018. If you already own Luminar just launch the application or plugin and follow the update instructions it offers. This is the fourth major update for Luminar. Skylum has already promised another update in December and free updates for most of 2019. Note: If you don’t own Luminar, get it for $49 and a free update to version 3 coming in December. While you may have used Vibrancy and Dehaze adjustments in Lightroom or Photoshop, this filter goes WAY beyond those results. Thanks to artificial intelligence, the filter can perform several steps and only needs a single slider to control it. First, the image is analyzed by Luminar. Thanks to a deep neural network, the software detects the sky. The neural network has been trained using hundreds of thousands of images with different amounts and different types of sky. The AI detects looks for foreground objects. It can also define edges and analyze gaps and spaces. It then looks at the textures and tones of the sky itself. Once the analysis is finished, Luminar performs semantic segmentation, separating the image into different layers, based on the objects it detects. Internally, the image is layered and masked (all of this happens ‘under the hood.’) You can now make adjustments with a single slider to enhance the detail, depth, contrast, and sharpness of the image. The results are quite impressive. Color, contrast, tone and more are selectively handled. Adjustments enhance only the sky itself without altering the edges or other areas. Skies looker richer with great detail and vivid color for natural-looking results. A lot of photographers and creative pros are resistant to AI. Wondering how could they possibly trust a computer to figure out what’s wrong in a picture? But the truth is, that AI, if done right, can be a HUGE timesaver. You see Artificial Intelligence is built on real intelligence. The team at Skylum analyzed hundreds of thousands of images as well as took input from professional photographers. The computer was taught what to do when it encountered sky and how to identify different objects. The results are a huge timesaver, yet you remain in complete control over how much enhancement is applied to a photo. The image of the arch was only processed with artificial intelligence. It started as a 14-bit raw file, which meant there was a lot of detail hidden within the image. Not a single manual selection or mask was made. AI Sky Enhancer was applied 3 times. The filter is designed to not be overly strong. If an image is very needy, you can apply a filter multiple times or just duplicate it. A lesser value of Accent AI was applied at the end for a bit of brightening and contrast. The total editing time – 18 seconds. That’s just amazing considering how complex the selections and edges would be. The highly compressed JPEG file from one of the smallest sensors out there still creates a great-looking photo. Sky Enhancer and Accent AI work on images from 12-bit Raw through 8-bit JPEG and all come away looking better. We encourage you to give the filter a try. It’s really quite amazing with how well it works. WANT TO BUY IT? If you want the lowest price click here to get Sky Enhancer plus a free update to Luminar 3 in December. If you want to know every detail inside and out, here’s a video that the Skylum team asked me to make. 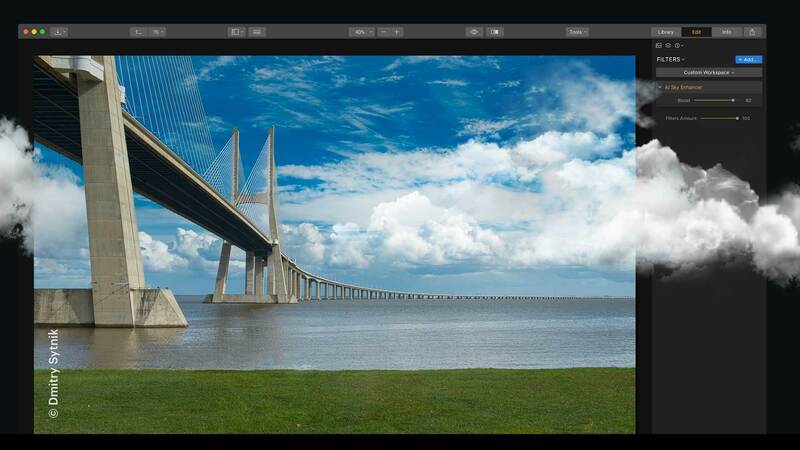 It walks you through the new Sky Enhancer in-depth.